Researchers from the University of Southampton have developed new tungsten fluoride complexes that could help understand the properties of future compounds used in medical and industrial applications. The series of molecules, first prepared within the School of Chemistry, are very unusual as they contain a highly oxidising tungsten ion directly bonded to the phosphine and arsine groups. 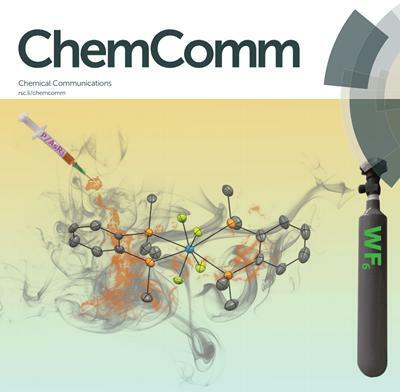 The structures and properties of the new class of compounds have featured on the front cover of The Royal Society of Chemistry’s Chemical Communications. The findings from the Functional Inorganic Material and Supramolecular research group have included contributions from Professor Gill Reid, Professor William Levason, Dr Wenjian Zhang and Dr Francesco Monzittu. The research reacted tungsten hexafluoride, itself a gas at room temperature, with several phosphine and arsine ligands, before identifying the new complexes through X-ray crystallographic and spectroscopic analyses. The School of Chemistry is home to the UK’s National Crystallography Service, with outstanding X-ray diffraction facilities. “Complexes containing metal-fluoride groups often show very different properties to the heavier chloride and bromide analogues and can give rise to quite different applications,” Francesco says. “For example, metal fluoride complexes are being developed for applications as catalysts or as specific fluorinating agents. Relevant work from Professor Gill Reid’s group, as well as exciting developments in organo-fluorine chemistry from Professor Bruno Linclau’s group was presented at the 22nd International Symposium on Fluorine Chemistry in Oxford in July 2018. The symposium is a key event held every three years when world-leading experts on all aspects of fluorine chemistry gather to share their latest results and developments.